In the past three articles of our series Rug Cleaning 101, we discussed the importance of receiving training before starting rug cleaning, why you should be cleaning these textiles in a shop or plant environment, and we reviewed the pre-cleaning inspection process. Now let’s look at how to equip your new rug cleaning facility, however humble it may be. Lots of options are available for all budgets; think of this investment along the lines of buying a new truckmount and van. 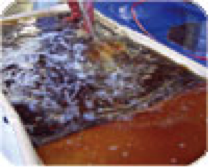 The first step in cleaning any textile is dry soil extraction, so let’s look at your options. 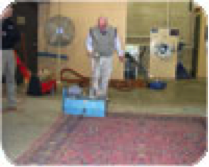 If you have a large volume of rugs to clean, automatic dusters are available again. This type of duster was once only available from the Moore Company (which is no longer manufacturing), but is now available from Centrum Force. 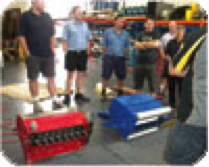 Portable dusters are what most new rug plants are using because they are affordable and effective. 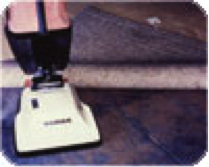 The original rug duster was from the Hild Company and is long out of production – but you can still see them in use. The two manufacturers offering portable dusters today are The Rug Badger and Centrum Force. If you do not have the budget for a rug duster, use a good upright beater bar vacuum cleaner. First, vacuum the face of the rug, then the back. Sweep the floor, then vacuum the face again. You could then repeat the process and continue to remove more dry soil. The next step in the process is choosing the cleaning method that is most suitable based on your pre-cleaning inspection, including the construction of the rug. If shrinkage or bleeding is a concern, use a low-moisture method like an absorbent compound or encapsulation. 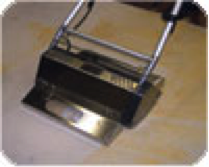 Hot-water extraction equipment can be used to clean rugs of course. 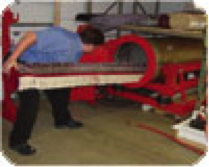 However, on natural fibers turn down the pressure to no more than 200 psi to prevent pile distortion. And turn off the heat! Yes it will slow down the cleaning process a little, but hot water can contribute to dye bleeding and shrinkage. Use a longer dwell time with your chemicals to compensate for the lack of heat. Extremely soiled rugs can be cleaned using an immersion process, if the rug can withstand an invasive cleaning method. The more thorough you are with the cleaning process, the more likely you are to encounter dye bleeding, pile distortion, shrinkage, and hidden defects in the rug. Only use this method after a complete pre-cleaning inspection. This method is the most effective way to remove urine. After washing the rug and grooming the pile, it is ready for the dry room. Place on a dry pole or flat on a rack if you are concerned with possible dry bleed. One piece of equipment receiving more and more attention is the centrifuge. After the wash process, the rug is spun to remove the vast majority of the water. With less water in the rug, dry time is decreased substantially, including browning of the fringe. Both Centrum Force and The Rug Badger offer centrifuges. 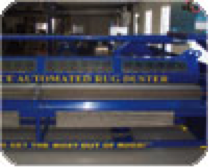 With the great variety of equipment available to the rug specialist today the task of washing rugs has become easier. Next time we will look at the proper cleaning chemistry to go with the equipment we have discussed.